I found an old cookbook called, “Amish Cooking” at my favorite used bookstore last week that is packed full of delicious inspiration. I love Amish recipes because they’re usually simple, homemade and comforting which perfectly describes my own cooking style. This bar recipe is the first one that I’ve tried out of the cookbook and it did not disappoint. It was such a simple recipe that I let my 3-year-old “help” me. I had to improvise a little bit because the directions were almost too simple. 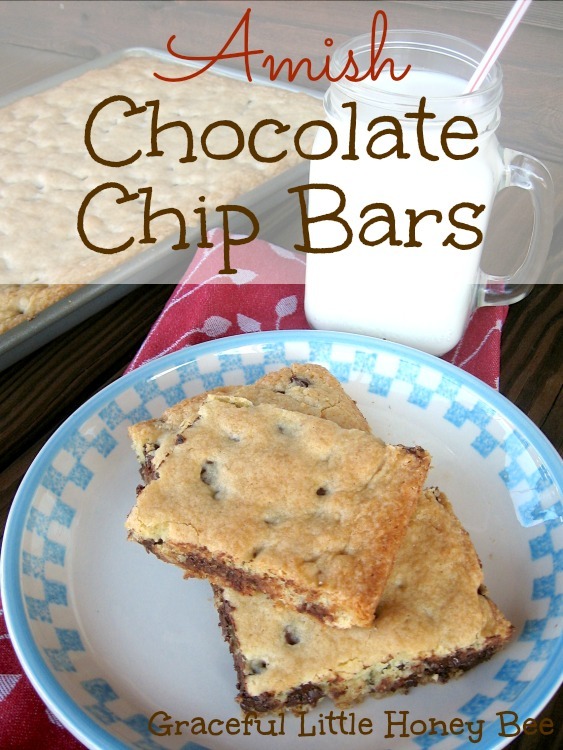 So here’s my adapted version of these delicious Amish Chocolate Chip Bars. Step 2: In medium bowl, mix dry ingredients. Step 3: Add remaining ingredients and mix thoroughly. Step 5: Bake for 25-30 minutes or until golden. Step 6: Let cool and slice into bars. Enjoy! In medium bowl, mix dry ingredients. Let cool and slice into bars. Enjoy! I hope they enjoy them!! I love all things chocolate chip. Thanks for a great looking recipe! It's pinned. I'm here from the Modest Mom link-up. By "cookie sheet", do you mean something like a jelly roll pan? What dimension pan are you using? My cookie sheets don't have sides. Yes, a jelly roll pan. The one I used was 10"x15". My grandmother makes these sometimes, and I love them. She has a little different recipe but this one looks great! I will definitely have to try it. They will be great for some bake sale fundraisers I am doing for my missions trip. Thank you for the recipe! I love how simple this recipe is! I love to bake with my boys and this will be a perfect recipe to try with them! Thanks SO much for linking up to Hit Me With Your Best Shot last week! I hope to see you again this week! It's called, "Amish Cooking" and it is spiral bound.